OPW offer a range of loading arms and related equipment for bottom-loading. The two most popular configurations are the API type Bottom Loader and the API type Hose Loader, both of which are detailed below. At Assentech we work closely with OPW to ensure the arms we provide are of the best configuration for their requirement, carrying out site survey and installations as required. OPW’s supported and unsupported boom type bottom loading arms are designed to provide flexible long range operation with compact stowage. By swivelling through 5 planes of rotation (minimum) the low level bottom loading arm offers complete flexibility. The arms can be supplied equipped an API coupler, Dry-disconnect coupler, threaded connection, flanged connection, breakaway coupler or any other customer-specified end fitting.loading or unloading, railcars, tank trucks or ISOTAINERS. As standard, the arm has adequate reach to connect to a tanker at the side, at the rear or underneath. In addition, the intermediate and end swivel assemblies can be orientated upwards or downwards for optimum ease of operation. To assist self-draining capability optional Low Profile Swivels may be selected in critical gravity unloading applications. OPW bottom loading arms are available in many different configurations to accommodate specific customer requirements and can include jacketing and trace heating as required. OPW bottom loading arms are designed to accommodate the widest range of possible working envelopes described in the API 1004 RP. 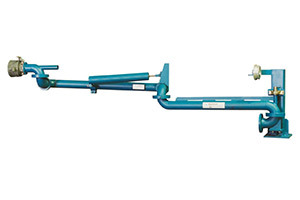 As long as the truck fittings are in accordance with API 1004 RP, OPW bottom loading arms can be connected to any of or all off the truck adaptors, allowing simultaneous loading of multiple compartments. This is the major advantage of bottom loading and one which is fully considered in OPW’s comprehensive loading arm design. OPW bottom loading arms are available in a variety of configurations to accommodate specific customer requirements and can be ordered with or without an additional drop hose swivel for added flexibility and increased hose life.